YOU GUYS. This was a top ten highlight in my wedding planning career. Hands down! 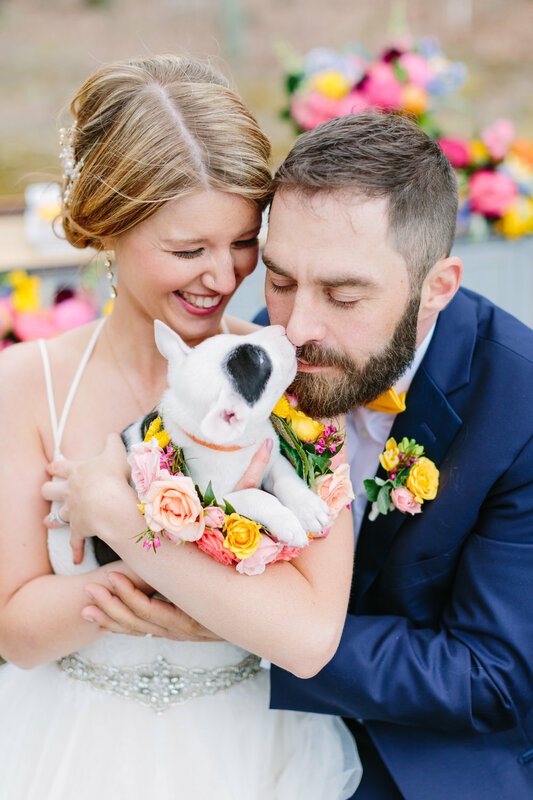 When Danielle from For The Love Of Paws came to me with the idea for a wedding styled shoot to help Buddy Dog Humane Society and Great Dog Rescue adopt out their pups - my answer was a big, huge YES! I grew up around animals - a great dane, rabbits, parakeets, a hamster and four cats - and in the most recent years have adopted two rescue dogs. Needless to say, this cause holds a very special place in my heart. The shoot took place in Hopkinton State Park in Hopkinton, Massachusetts. The perfect, woodland background for puppies and pretty things! The puppies were a new litter rescued by Great Dog Rescue New England - there were NINE of them and they got OH SO MUCH love that day. Axel (bottom left) was a newly adopted pup from Baypath Humane Society - he was so sweet and we're so happy he found his forever home! What's a wedding without an invitation?! How cute is this suite by Kate Yenrick Design! If you're incorporating your dog in your wedding, and looking for a more unique RSVP - I love what she did with the answers here. "Good boy!" and "In the dog house" - ha! Flair Boston was generous enough to lend us these gorgeous bridesmaids gowns by Jenny Yoo and Theia Couture. Don't they look so pretty with the bright floral collars by Beach Plum Floral? I can't get over the gorgeousness of these blooms! While we're talking about me not being able to get over things - I'M OBSESSED WITH THIS GOWN. 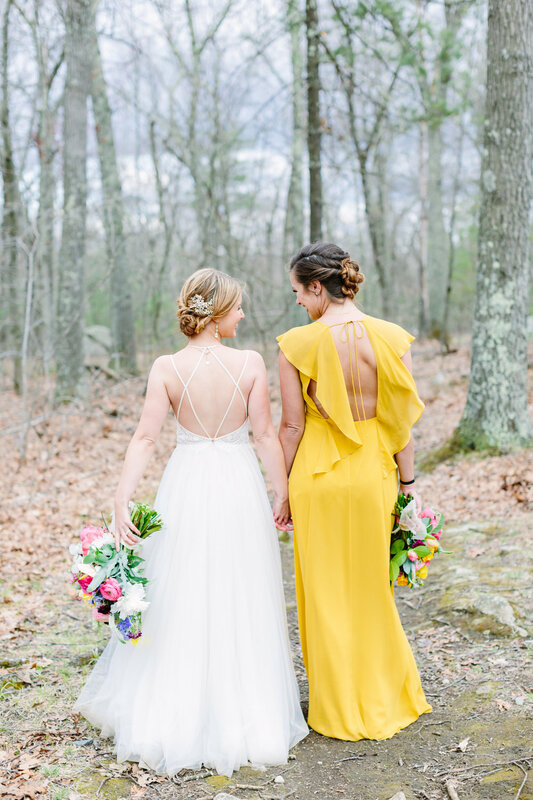 Chartreuse was my inspirational pop of color at the root of the design for this entire shoot. This Jenny Yoo gown is what dreams are made of! It looks so pretty in this setting, and of course next to her BFF in the also amazing Willowby by Watters for BHLDN gown. 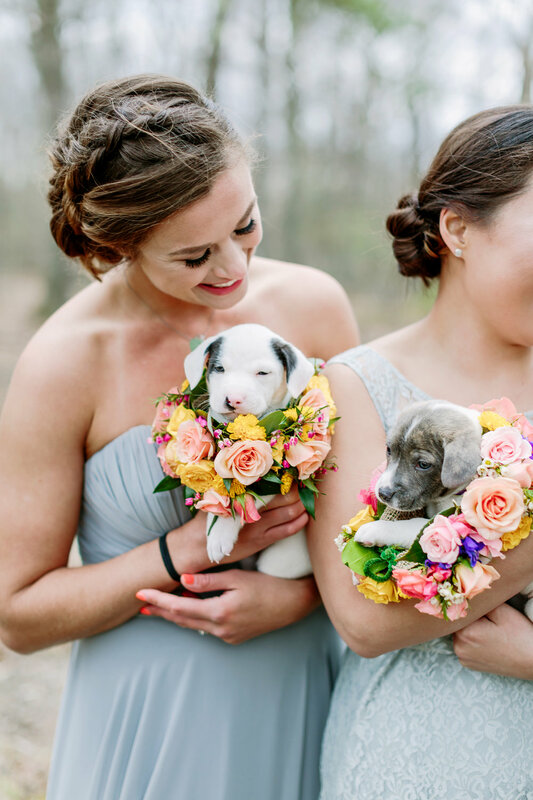 I mentioned Jill and her team from Beach Plum Floral designed the floral collars for our pups - but can we talk about these bouquets for a moment? ALL THE COLORS! As soon as winter turns to Spring - I love brightly colored bouquets, right before the trees bud and the leaves come out. How insanely PERFECT are these? PS - a shoutout to our hair and makeup stylists who made these gals look even more beautiful than they already are! Steph from The Bridal Bar did everyone's hair WITH NO HOT TOOLS. Her hands, hairspray, and bobby pins. Goddess! And last (but certainly not least!) - what's a wedding without dessert? Delia's Kitchen and Bakery donated this beauty - as well as the tasty looking cupcakes. And For The Love Of Paws baked up those puppy treats like a boss. A HUGE THANK YOU to the vendors & volunteers involved in this special day. We couldn't have done it without you! Hair Stylist: The Bridal Bar stylist Stephanie G.